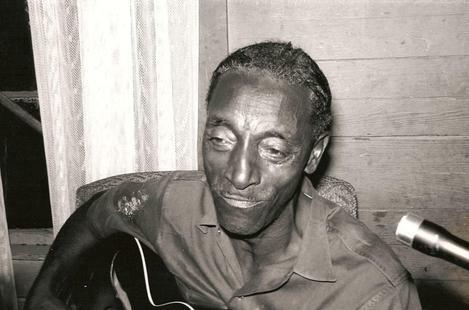 One of the most talented musicians of his time, Fred McDowell performed to large crowds all over the United States and Europe for several decades. He also spent most of his life working at a service station in Como, Mississippi, where I first approached him. This was in 1967. Fred couldn’t have been more excited about doing a recording session and insisted we hire Johnny Woods, his old friend and a local legend, to accompany him on harp. No one in the area had seen Johnny in about either years, but Fred had heard he was back in town. Three hours on a dirt road later, we pulled up to a dilapidated shack in a town called Senatobia and found Johnny Woods – who I later found to be a cordial, gentle man, forty-something, one hell of a harp player – passed out on the front porch. Crammed inside the two-room house were fifteen or twenty men boisterously enjoying their Sunday afternoon, drinking and shooting craps. “Hey, Shake ‘Em, what you doing?” they greeted Fred, who is best known in the area for his performance of “Shake ‘Em on Down.” When Fred sat down with his guitar and a bottleneck, everyone joined in. A couple of songs later, Woods dragged himself in, still in a haze so thick you could see it in his eyes. He started rummaging through his pockets for his harmonica, and when Fred launched into “Shake ‘Em on Down,” Johnny’s shrill harmonica joined the whang of the guitar to make a sound powerful enough to bring the walls down. We arranged for Woods to meet us at Fred’s house the following evening. Woods never showed that night, so we spent the next few days trying to track him down. We finally found him at a barbeque, stopped behind a car sneaking a swig from a friend’s bottle of corn. Wodds agreed to go right then to a nearby house to record. It was hard to believe that these two men had not played together in eight years. No practice was necessary; there were no second takes. They sat facing each other while Fred gave Johnny instructions under his breath. The veins in Fred’s face bulged as he sang and played, and the spit drooled from Johnny’s harmonica, which might as well have been a natural extension of his mouth. It is an honest and electrifying thrill to present two for the greatest living blues men together, on tape, for you, and the rest of the world to hear.